In the summer of 1955, Frederick Baldwin, a college student at Columbia University, set out on a pilgrimage of sorts, hoping to meet Pablo Picasso. Baldwin traveled first to Le Havre (presumably by boat), then headed south, down to Vallauris and Cannes, until he eventually reached Picasso's home on the Riviera, known as Villa la Californie. It took a little craftiness and moxie, but the young American gained entrance into Picasso's studio. 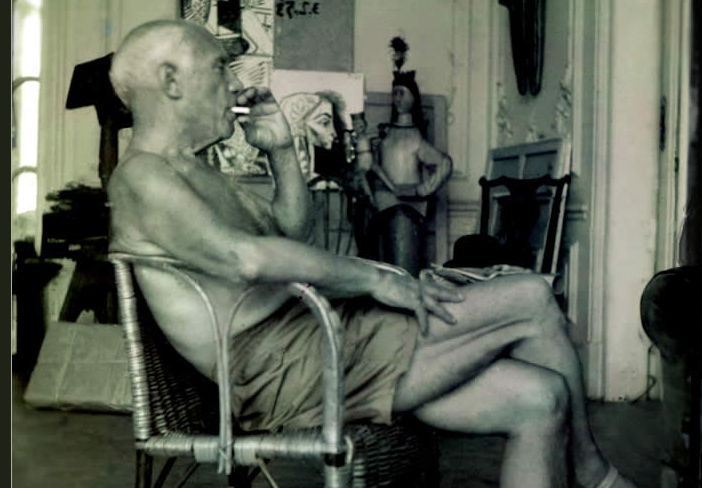 And there he was, the great painter himself, wearing shorts, sandals and not much else. More than five decades later, Baldwin has produced an elegant e-book (available for free right here) that uses photographs and text to preserve the memory of this defining moment. After meeting Picasso, Baldwin became a professional photographer, working for Audubon, LIFE, National Geographic, Smithsonian Magazine, and The New York Times, among other magazines. And, later, he looked to "replicate the Picasso experience professionally," always controlling his own agenda, never taking a job where he wasn't making his own decisions. You can download the 22 page e-book, Dear Monsieur Picasso, right here. Find more great texts in our collection of Free eBooks.